Due to unwanted fat, extra pounds and/or cellulite, many of us feel heavier than we are and older than our actual age. Imagine the possibility of decelerating the aging process, dropping pounds and reducing cellulite. And picture reaching these goals with a fast and easy treatment, an automated technological lymphatic massage therapy called Press Away Therapy™. Press Away Therapy™ assists your body’s lymphatic system in ridding excess congestion, fluids and toxins. Here’s how your body’s lymphatic system works. As blood flows through the body, some of the fluids from the blood leak out through the blood vessels into the surrounding tissues. This accomplishes two things: it provides the surrounding cells with nutrients and it picks up toxins from the tissues to eliminate from the body. The lymphatic system works continuously just like the cardiovascular system with one important difference. The cardiovascular system has a pump, the heart; but the lymphatic system has no pump. That is why we sometimes need to assist our lymphatic system. 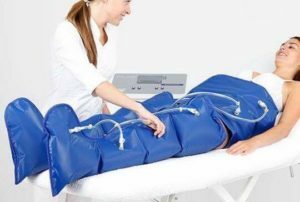 Press Away Therapy™ provides a pumping action to assist your body in the elimination of waste, liquids and toxins from your tissue. Your body will then eliminate this liquid waste through your sweat and your urine. The treatment takes less than an hour and is quite comfortable, like a light massage. By increasing lymphatic flow, Press Away Therapy™ will leave you with a general feeling of well-being in addition to eliminating fat cells and smoothing the cellulite appearance. In addition, many of those who suffer from headaches, back pain and fatigue find improvement of their symptoms from the detoxifying effects of Press Away Therapy™.